Fix PDFs which fail to display in Preview (beta). Is there a better alternative to Preview Reset? Is Preview Reset really the best app in Desktop category? Will Preview Reset work good on macOS 10.13.4? Preview Reset was designed to be a one-click solution: it diagnoses which associations are broken, then sets about figuring out which applications have incorrect file associations. Simply click the "Reset" button to move these apps to the trash and perform a handful of operations to clean up the mess. 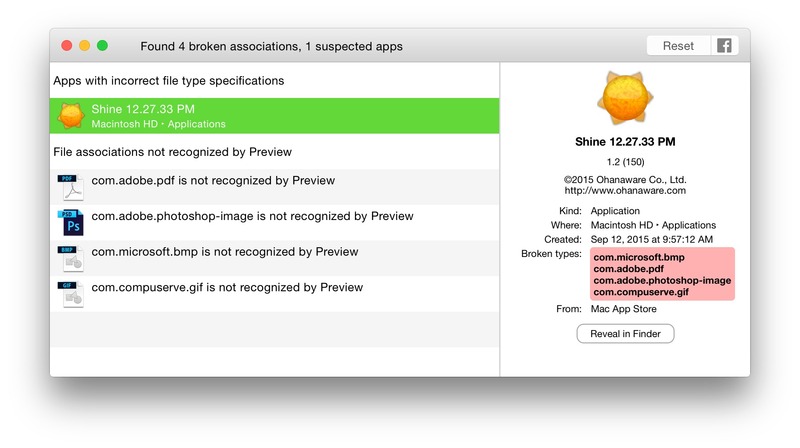 Note: Although Finder indicates that this is version 1.0 Beta, the developer states that this is version 1.0 Beta 2. Fixed some bugs on 10.9. Fixed a cosmetic bug with the "Preview appears to be okay" screen. Added the ability to share Preview Reset on Facebook and Twitter. Preview Reset needs a review. Be the first to review this app and get the discussion started! Preview Reset needs a rating. Be the first to rate this app and get the discussion started! At Ohanaware we found out firsthand what incorrect file-type associations can do, and from this experience we've built a tool to find other apps that have the same problem--so we're giving it away for free.